Here’s the first thing you should know about me: I don’t really know how to travel. I just go and figure it out, and most of the time, it’s in the moment. Second thing: I love biking. Even though I don’t, I’m pretty sure I’m supposed to spend most of my time biking because moving from one spot to another on two wheels makes sense to me than most things. We fit like gloves. There is no problem that can’t be solved by sweating, and for me, if I’m sweating on a bike, it is THE magic maker. Third thing: I have a very poor sense of direction. I don’t know who to blame for that, but I know I can’t blame my parents so even though I terribly want to give an excuse for why it hasn’t improved with age, I simply own that about myself. This third thing is what makes travel even more of an experiment for me. Now, people argue with me, suggesting that I should just use my smartphone. It’s what everyone is doing. While this seems like a simple solution, I prefer to remain unplugged during my travels, and if I am always on my phone trying to find my way around, I won’t feel unplugged at all. I try to go on a vacation from almost everything when I’m on vacation. Every now and then, I’ll roll up old-fashioned style to a desktop computer to see what’s happening on Facebook, but in general, I want to keep it simple. That’s how you make room for why you’re on vacation in the first place. John Muir was a master at embracing being lost, and searching for more wild places so it seems fitting that Scotland’s route was full of challenges and surprises. 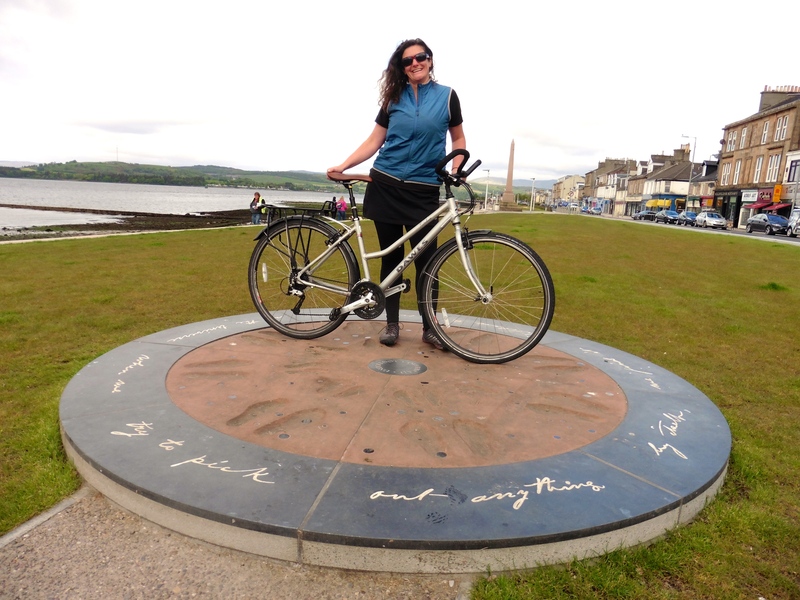 When I set out to bike the John Muir Way (Scotland’s 135 mile, but add a lot more from being lost in navigation, coast to coast route from Helensburgh to Dunbar), I had no idea what to expect, but I knew for sure that I was going to get lost over and over and over looking for the very tiny purple signs posted along the route on stumps and posts high and low. Life. And when you are lost by yourself on a bike in the woods of a country you are not familiar with, somehow, you come out the other end a better person. This becomes a main objective in life-to get lost, to be bold, to make yourself slightly uncomfortable because most of the time, we rest in the meadow of safety and comfort. Here are just a few shots from my trip.